A huge arrow-shaped storm blows across the equatorial region of Titan in this image from NASA's Cassini spacecraft, chronicling the seasonal weather changes on Saturn's largest moon. The part of the storm that is visible here measures 1,200 kilometers (750 miles) in length east-to-west and 1,500 kilometers (930 miles) in length. The mystery of a giant arrow-shaped cloud on Saturn's largest moon Titan may now be solved, a new study suggests. The enigma was likely caused by a massive wave rippling through the moon's atmosphere. The discovery could help scientists better understand similar phenomena on Earth, especially in light of changing global climate, researchers said. To understand just how such a bizarre cloud might have formed, planetary scientist Jonathan Mitchell at the University of California, Los Angeles, and his colleagues simulated the moon's atmosphere with a three-dimensional global climate model. The researchers discovered that waves at Titan's equator could organize clouds into this shape. To picture how waves might do so, imagine a wineglass ringing with a pure resonant tone. "A wineglass can only support certain types of sound waves because of how the system is structured, and the same holds true in this case on Titan," Mitchell told SPACE.com. "It's just the natural way the system wants to vibrate. Individual clouds might 'ring the bell,' so to speak, and once this ringing starts, the clouds have to respond to that vibration." Future studies can look at the entire archive of observations of Titan from Cassini "for other distinct, cool-looking clouds," Mitchell said. 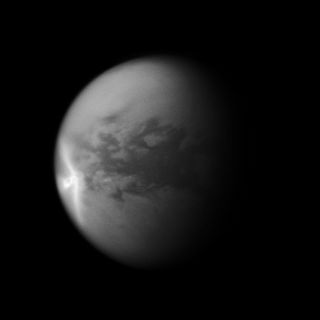 "The hope is that we can repeat this sort of analysis to learn even more about what shapes Titan's weather." Such research could shed light on Earth, "since Earth and Titan are sort of like strange siblings," Mitchell said. He noted Titan's atmosphere was much like that seen at Earth's tropical zone around its equator — "things that only happen at Earth's tropics are spread all over the globe on Titan." "These planetary-scale waves that organize storms on Titan are much like waves seen organizing storms in Earth's tropics, although they're less obvious here," Mitchell said. "My hope is that this helps us understand Earth's weather in a changing climate." The scientists detailed their findings online Sunday (Aug.14) in the journal Nature Geoscience.